Recent analysis of our business by experts in sustainability has assessed ICL Fertilizers as being among the top performing global suppliers of crop nutrition products. The ICL Fertilizers website is packed full of details of the wide range of high-performance fertilizers we produce and how they benefit the crops grown by farmers around the world. Whether it is one of our conventional fertilizers, or something from our new premium FertilizerpluS range, you can find details of the product, as well as the crops and conditions that they are best suited to. But what matters at ICL is not just what we produce, it is also how we produce it. 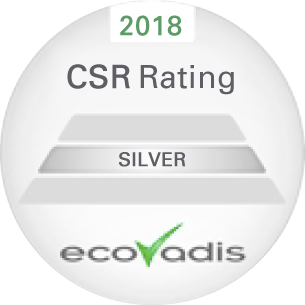 We have just completed our first annual ‘Ecovadis’ Sustainability Assessment and we are pleased with the results - so much so that we wanted to share some highlights from the report. In this independent assessment we scored particularly well in the Environment and Labor & Human rights sectors, achieving 70 out of 100 in each. When all our scores are taken into account, the assessment reveals that we are among the top 7% of globally-ranked suppliers across all sectors. This score earns ICL Fertilizers a silver ranking. Of course, we are pleased to be in the top 7%, but as a company we constantly strive to be even better. That is why we are already taking the actions needed to improve further; actions that we expect to gain us a gold ranking in next year’s report. As a company, we will continue to systematically improve our practices in all areas of sustainability, proving our commitment to all our stakeholders, and our customers. So when choosing a fertilizer from ICL Fertilizers you can be confident of the quality of the fertilizer, and also the care and commitment that has gone into developing, sourcing and producing each and every one of our fertilizers.